We found a recipe online that had raving reviews, and seemed pretty simple, so we adapted it to include some really yummy seafood, and put our spin on some of the spices & techniques. It turned out to be the perfect paella… not too saucy, yet not dry; tons of flavor, and perfect balance between the chicken/Andouille sausage and the seafood. My dad LOVED it. 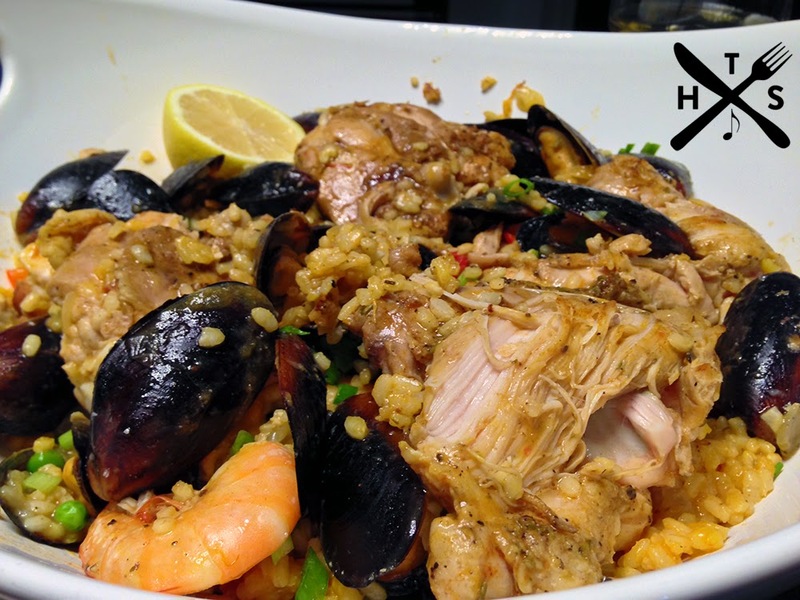 No need to be afraid of making paella any longer. This recipe is not very involved at all. Enjoy! Rub chicken down with Herbes de Provence, smoked paprika, 1/2 teaspoon salt, and black pepper. Heat the oil in an 8-quart nonstick pot or large skillet over medium-high heat. Add chicken; cook 3 minutes on each side or until lightly browned. Remove chicken from pot; cover and keep warm. Add sausage, onion and bell pepper to pot; cook 7 minutes, stirring constantly. Remove & set aside. Add shrimp & fish to pot; cook 2 minutes on each side; remove & set aside (seafood will not be fully cooked). Return sausage, onion, and bell pepper mixture to pot. Add rice, tomato, paprika, saffron, and garlic; cook 1 minute, stirring constantly. Return chicken to pot. Add broth and 1/2 teaspoon salt; bring to a boil. Cover pot. Bake at 400° for 10 minutes. Stir in shrimp, fish, mussels, asparagus, and peas. Cover and bake an additional 5--8 minutes or until chicken & seafood is completely done. Serve in a large bowl with mussels featured on the top. Finish with sliced green onions & lemon wedges.